Adobe Photoshop can be a lot of fun to use. This photo editing software has plenty of tools that will be able to let you transform any picture in to a work of art. And, you will be able to have a lot of fun in the process. For example, if someone needs their picture taken but they have this awful looking pimple, you will be able to remove the pimple with Adobe photoshop. This is only one of the many tricks that this photo editing software can provide you. Using the smudge tool, you can easily remove skin imperfections, such as pimples, scars, and even wrinkles. So, if someone wants to look younger, you can easily erase their wrinkles and make them look 10 years younger. Oily skin is another problem that a lot of people have when they have their picture taken. With Adobe Photoshop, the ugly shine on the face will instantly disappear with just a few clicks of the mouse. Skin tone can also be changed with Adobe Photoshop. You can easily make someone look like they just got a tan from the beach or you can remove the sunburn and make them look a little lighter. We all know that group or individual photos are ruined with that photographic phenomenon that we call as the red eye. This is basically caused by light reflecting back from the pupil of the subjects. Usually, this is caused by the flash in the camera. Although some digital cameras today now has flash settings that claims to conquer the red eye occurrence, there is really no 100 percent guarantee to remove it. Adobe Photoshop can help you with this problem as it will be able to give you the red eye tool. This tool will help you eliminate the appearance of the red eye in a digital photo. In fact, you can even remove the red eyes even those of your pet car or dog. Adobe Photoshop also has tools that will be able to help clean up an image or even improve its appearance. This tool is the brightness and contrast tool, color enhancing tools, and also sharpening and blurring tool. If you have a dark photo where you really can’t make out the faces of your subjects, Adobe Photoshop will help you brighten up the photos with the adjust brightness and contrast tool. Also, it can bring out the vibrant colors of a particular photo. For blurred images because of hand shaking, it can be sharpened for that cleanest appearance possible. You have to admit that there are times where a seemingly great photo is ruined by objects or people in the background. In fact, there are even some strangers that will try posing in the background and you won’t even notice them until you transfer the image to your computer from your digital camera or you get it printed. With Adobe Photoshop, you can crop elements out of the picture. Whether it’s a stray dog, a trash can, or a complete stranger ruining the great moment, you can easily cut them out of the picture and fix the portion where you edited out the element as if nothing was there before. Adobe Photoshop can also give you the power to be artistic. 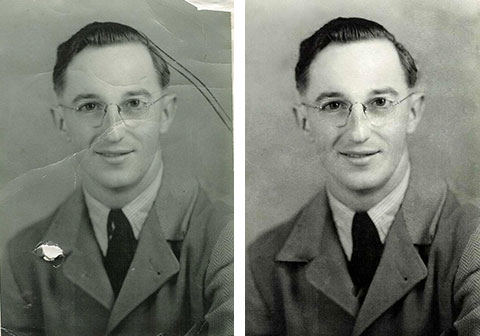 You can alter color pictures to black and white pictures and you can even make pictures look as if it is taken from a long time ago by applying the sepia effect. Also, a photo can be converted to look as if it was painted with water color, sketched with charcoal and etc. You can also be a little creative with your photos. For example, if you want to have a picture with the Eiffel Tower as your background, you can simply take a picture of yourself standing inside your bedroom. Just get a photo of the Eiffel Tower in the internet and you can paste the picture you took of yourself standing inside the bedroom and paste it in the Eiffel Tower background. There are a lot more amazing things that you can do with Adobe Photoshop. These are just some of the many great things that you will be able to do with Adobe Photoshop. Whether you are an amateur photographer or a professional one, you will see that Adobe Photoshop will have all the tools you need to edit a picture. To learn these techniques and many more simply purchase Photoshop Warrior Insider Secrets and you will become a truly skilled Photoshop Master!